When is the last time you really looked at your social media, other than creating posts? Was it when you first set it up? Or do you periodically check your profile and images and make sure everything is up to date? If you haven’t checked it for a while, then now is a very good time to do a Spring Clean. Your social media icons get looked at more than you think. I can spot my favourite ones a mile off and often scroll down straight away to read them. Whether you use your logo, part of your logo or an image, make sure you stay consistent across all the different platforms. If using your logo, make sure it’s clear enough to be recognisable otherwise you need to create an image that is. If using an image of yourself (especially for LinkedIn) make sure it’s professional looking and it’s the same one you use on your other marketing – in print, on your website. Again, whatever you use on one platform, make sure it’s consistent on other platforms. We have a habit of just updating the one that we use the most but it’s good practice to check that they all look consistent. That’s not to say they all have to be identical but they do have to follow your brand style. Think about the images you post on your social media – do they align with your brand or are you just scrabbling around looking for something or anything to post? Your images can make your posts instantly recognisable. Use the colours from your logo or brand palette if you have one as they’ll make your feed look more cohesive. When using stock photography, try find a particular style or similar elements to tie all the images together. If taking photos, use the same filter, similar backgrounds or colour theme. How you write your posts is as important as how they look. Now, I’m the first to admit that this is what I struggle with as I’m not a writer. But I do try to create a consistent voice, use particular words or phrases, and try match my voice to my business personality. Social media platforms are constantly changing and updating so I’m not getting into the teeny, tiny details but they do allow you to change sections to make them more prominent, they add new sections which can be valuable for your type of business, and some times they just mess ever thing up for you! So it’s definitely worth checking all your profiles regularly. And do check that your information is all up to date. You might have updated your services, prices, hours of work, so make sure your customers know what to expect. Sounds very obvious but again, how many of us bother to check? We just blindly keep posting and hoping for the best. There is so much advice on when and how often to post but ultimately these are your very own customers and they are very unlike any body elses. I post once a day on Facebook, early in the morning, as that’s when I seem to get most reach. Any other time and it’s a waste of a post – I might as well save it for the next day. I also very rarely share because I don’t get good reach with that. So take a look at your stats and analyse who your followers are, when they’re online and what they like to read, comment on and share. I usually do this at the end of the year because I’m a bit clutter obsessive and like to start the new year afresh but this is another job worth doing regularly. Try to be selective with who you follow – customers, other businesses, contacts, inspiring people, people in your industry, people you find interesting. Otherwise your feed will get so clogged up and let’s be honest, a bit boring, and you’ll just scroll through aimlessly trying to find some thing interesting to read. By the same token, try be selective with who follows you. Delete spam Facebook accounts. Don’t automatically connect with every one who asks on LinkedIn – ask them why they want to connect with you. Are you trying to be on every social media platform and losing the battle, so you’re not actually effective on any of them? Pick a couple of platforms, where your super customers hang out, and focus your efforts there. Do have an account on all platforms though as you never know where people might search for you or find you. I only use Facebook and Instagram but I publish a blog every month and add the link to all my social media accounts. So I know that if any one finds me on LinkedIn or Twitter or Pinterest, they’ll have a ton of useful information and know where to contact me if they want to know more. Rather than posting hurried, random posts about anything and everything, sharing other posts or selling all the time, take the time to create a social media strategy. It doesn’t have to take long and it’ll give you more focus. Take the time to plan topics or ideas to discuss. What is happening in your business this month and how can you link it to your social media. How can you engage your followers and make them interested in what you’re doing? Then schedule as much as you can. If you’ve already set all your social media up then it’s not so easy to change but if you’re just starting out, try use the same handle for all your social media. It just makes it so much easier to find you. I was lucky and managed to get @LizHallDesign on all the different accounts but I have searched for businesses and just given up as I haven’t been able to find them easily. Whatever you do with your social media, consistency is the most important. Not just with all the social media platforms, but with your website and your print marketing. You never know where people might find you, and what route they’ll take to get there. They might get your business card in person, take a look at your website then contact you through Facebook or Twitter. Make sure your business is professional and branded throughout the whole journey. 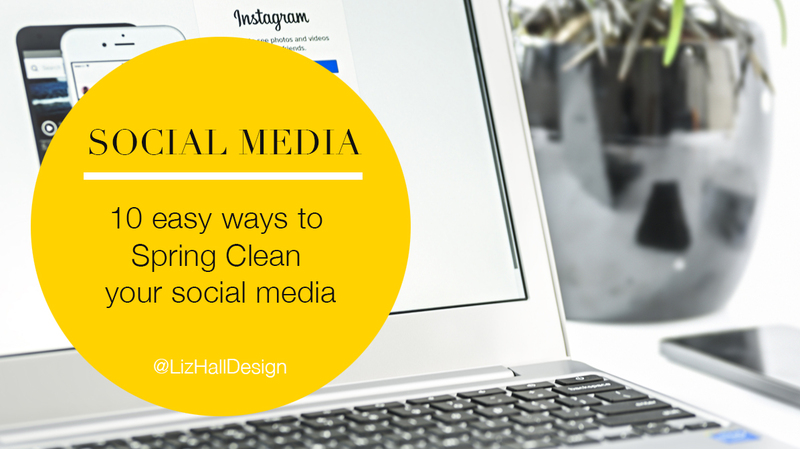 Do you regularly check your social media or is it still a job on your To Do list? Let me know in the comments.